Hmmm. Not the most appetizing of crackers, huh? My intention for this week was to bake crackers with an Indian influence using different kinds of flour. I made crackers with whole-wheat atta flour and semolina flour, and had chickpea flour left on my list. 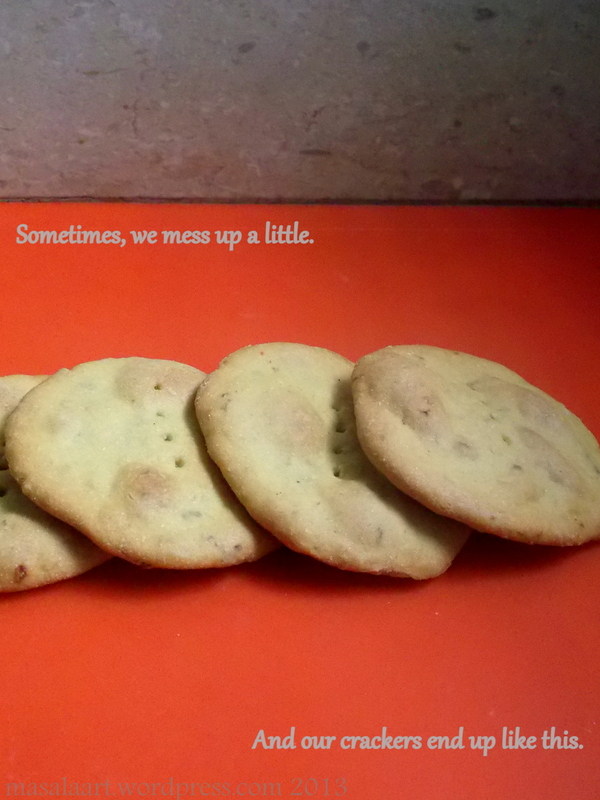 I wasn’t really following any recipe or method; just mimicking what I had done for the two previous crackers I made. I forgot how notoriously sticky chickpea flour (besan) can get. As a result, I had to shape these by hand, when I should have been able to roll it out and cut it into squares or circles. They tasted nice, and had a decidedly Indian flavour because of the ajwain or carom seeds, but they just needed to be thinner. Make a well in the middle of the flour and add the oil. Pour in the water slowly, mixing with your hand, and knead into a ball. The dough should not be too sticky, so do this part slowly and add just as much water as required to knead into a workable dough. If it does get too sticky, add some more atta flour. Shape into a large ball, roll out thinly on a floured surface or baking sheet. Slice into squares, or use a cookie cutter to make circles. Place on a baking tray and bake at 180C for about 20 mins till the edges are light brown and crisp looking. I’m playing catch up on your blog posts and randomly started here– I love that you’re making all your own crackers!!! No matter what you say, these are lovely! I’ve never used chickpea flour before but your cracker recipes are making me wanna bake something crispy!! !